Already have a basic line jacket and want to send it to us to get it customized? Click here. = included Save up to 30% when you order as a group. Learn more. Each letter is typically 4" tall. Regular letters and numbers are also available for non-Greek organizations. Split letters, 3-D letters, triple-layered letters, integrated icons. A monogram is one line of small embroidered text - your name, initials, nickname, a special date, time, etc. Split letters, 3-D letters, triple-layered letters. Includes any image that is already on our website or in our Design Library. Typically measures about 12 inches tall. Represent your line brothers or sisters. Your number is typically highlighted/reversed. *Extra fees may apply for very detailed images. We will copy the letters, sleeve text, line name, number, name of line, and colors from your jacket to create your crossing shirt. Artwork not included. 16" x 20" frame includes protective glass and is ready for easy hanging. Learn more. Emailed to you within 2 business days after you pay for the order. 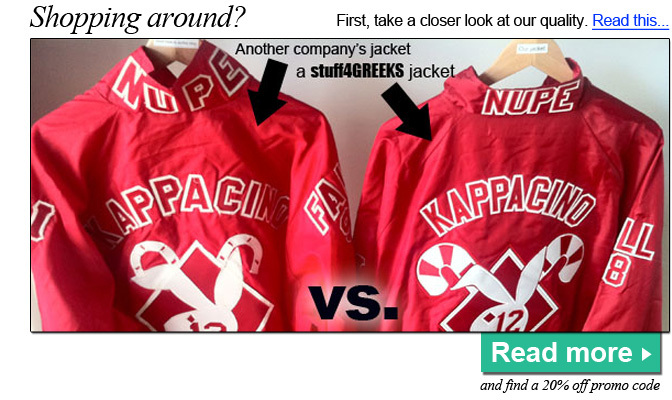 The Greek line jackets and other customized articles of Greek clothing in these videos were chosen based on their creativity and originality. We featured their stories on our website. Watch the video playlist above or read the stories here. When it comes to making custom Greek line jackets, also known as crossing jackets, S4G has been the world leader for over a decade. Not many Greek stores can truthfully say that they are the "best in the world" at something, but we can confidently state that stuff4GREEKS makes the best custom Line Jackets in the entire world. Yes we know that it is a bold statement, but we have the evidence and the experience to back it up. If you don't believe us, just look through our extensive photo gallery to see thousands of line jackets that we've made over the years - most of them with elaborate embroidered artwork on the back of the jacket - or you can read authentic testimonials from our customers. You can go all out and customize every area of your line jacket to make a "fully-loaded" crossing jacket, or you can keep it simple and just personalize your fraternity or sorority letters, colors, names, and numbers. 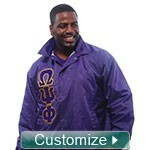 Customizing your stuff4GREEKS line jacket is as easy as ordering a Subway sandwich - just tell us what you want on it. We have thousands of line jacket designs you can choose from, and you can even submit your own sketch. When you wear your stuff4GREEKS jacket, it will feel like you are wearing the Mona Lisa on your back! People you walk by will turn their heads to check you out. We can make line jackets for every fraternity and sorority.... You dream it. We design it. In addition to custom Greek line jackets, we also make satin baseball jackets, track jackets, pullover jackets, Varsity Letterman jackets, and Greek blazers (sport coats) for men and women. We also have tons of other customizable Greek clothes and gifts available here. Want to see some cool jackets? Click here to check out our Facebook photo albums. Legal Disclaimer: All images displayed on this site have been previously submitted by customers for novelty purposes only. Any similarity between the images contained herein and any person's likeness or any company trademark is purely coincidental. Greek letters, marks, and emblems related to a specific organization are the copyrighted property of that organization. As the customer, you affirm that 1) you have the legal rights to use any artwork that you request or submit to be used in creation of your paraphernalia, and that 2) the artwork you submit or request is considered appropriate by your organization. stuff4GREEKS assumes no liability or responsibility to determine whether a customer has secured consent from any party for the use of their image, logo, or trademark. The usage of this web site or viewing any of the pages contained herein constitutes your acceptance of these terms and conditions.